And by Kentuckywood we mean it was made in Kentucky with some help from Hollywood. Well, okay, from Texas, actually. One day, Matthew McConaughey said "Alright, alright, alright" and called the Bourbon legend Eddie Russel of Wild Turkey and told him he'd love to make a special kind of Whiskey. And they did. They compared notes, Matthew made a lot of calls in the middle of the night, and they created Longbranch. Longbranch means an extending welcoming hand and it's not-so-secret secret is Mesquite. It's the actor's favorite grilling wood and it grows in Texas. They used it to refine the Bourbon and give it "that scent you remember." Now, we know involving celebrities in anything is like betting on an aging horse that lives on sour mash Whiskey. It could go either way. But this time, it seems McConaughey really put himself into the process and one of the indicators the Master Distillers Jimmy and Eddie Russell themselves are confident in this collaboration is the fact that this is the first time Eddie Russell isn't the only one signed on the bottle. He shares that sacred space with McConaughey. So, hum and pound your chest like a Wolf from Wall Street and have a sip of this rare and special potion. 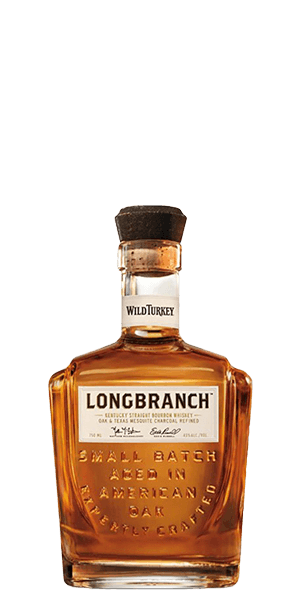 What does Wild Turkey Longbranch Small Batch Bourbon taste like? The Flavor Spiral™ shows the most common flavors that you'll taste in Wild Turkey Longbranch Small Batch Bourbon and gives you a chance to have a taste of it before actually tasting it. Vanilla syrup and corn sweetness on the nose with hints of toasty grains. Caramel and spices on the palate with subtle smokiness and a hint of oak and char. It's warm and smooth from start to finish. Warm and dry with a trail of caramel and spice with a final hint of smoke. Very clean tasting, dry not overly sweet. Little alcohol on the back side but heck at $32.00. When tasted on the rocks it’s very light but flavor is there. Smooth light and smoky bourbon. Very smooth and flavorful. For the price point a good everyday sipper. Had some of this last night at a bar (one ice cube). I really enjoyed it. It’s ridiculously smooth. There’s a gentle mesquite smokiness balanced with both sweet and spicy. I’m not usually impressed by celebrity ‘vanity’ projects but I have to say that Mr. McConaughey and Mr. Wild Turkey made something great here. Smooth and tasty, you just can't go wrong with anything from Wild Turkey. If you like a smooth bourbon with caramel, smoke, and spice, this is the bourbon for you. Sadly, it’s wasn’t my favorite for the price. Solid, drinkable bourbon. Isn't too harsh and has a nice sweet smokiness. Interesting take on bourbon. Different in finish than what was expected, but the perspective will grow on you. Quite good. Pretty nice mixing byron. Great in an old fashion. You can really taste the mesquite, it has more of a bite than some others but still good. Nice flavor, but a bit soft at the low proof. Very drinkable, but could be so much more. Its a good albeit a little too simple for the price. Solid bourbon all in all. As smooth as its creator most pleasant indeed. Wood notes give it a nice finish. Oh man! This is a superb collaboration if there ever was one..the best of Kentucky and Texas. I had the privilege of tasting this in Kentucky at Wild Turkey’s Distillery and it didn’t disappoint. The hint of mesquite blends nicely with WT’s mash bill to give you a gentleman sipping bourbon. I’ve since bought two bottles for my enjoyment.